MilitaryVetsPX.com - Machinist's Mate MM for sale. This is the appropriate rating patch for US Navy personnel with the rating of Machinist's Mate MM1, MM2, or MM3. 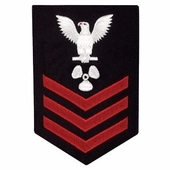 Navy rates are only sold as first class rates and can be cut to second or third class. Machinist's Mates (MM) ensure the continuous operation of engines, compressors, gears, refrigeration, and air-conditioning equipment aboard U.S. Navy ships and submarines. Sub-designations of the Machinist mate are Nuclear (MMN), Submarine Weapons (MMW), and Submarine Auxillary (MMA).